The 2nd 5G Global Event will be held in Rome, Italy and will be organised by the European 5G-Infrastructure-Association in co-operation with IMT-2020 (5G) Promotion Group, the 5G Forum, the 5G Mobile Communications Promotion Forum, and 5G Americas. The event will offer participants both lively debates around spectrum, standards and deployment of 5G as well as exciting demonstrations on the latest 5G technology developments. The event will in particular cover the main results of European 5G-PPP projects. The registration is now open and the “early bird” registration for 150 Euros (taxes and charges included) is available until the 7th of October. After the 7th of October registration will cost 250 Euros (taxes and charges included). CHARISMA, mmMAGIC and METIS-II were very active at PIMRC 2016.
mmMAGIC showcased 5G mm-wave hardware demos, phased-array antennas, channel model and visualization software. The project had a record attendance of 60+ in its booth from across the world, as well as very high visibility at IEEE PIMRC with two excellent 5G panels with mmMAGIC speakers (50+ attendance each).The mmMAGIC paper “Speeding up mmWAve Beam Training through Low Complexity Hybrid Transceivers” from IMDEA networks Institute has won PIMRC 16 Best Student Paper Award and several other papers plus another panel from the project were presented at this year IEEE PIMRC. 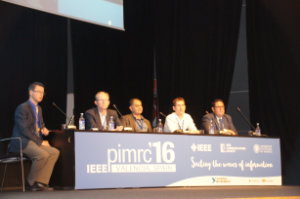 METIS-II successfully organised the panel 1 “What is relevant research for 5G Advanced?”. The calls for 5G PPP Phase 3 projects will be announced in 2017. Between now and then stakeholder discussions can influence the call text with regards to highlighted topics, impacts required, aims and objectives. As part of ieeehealthcom2016.com, the 5G for Healthcare workshop was organised by 5G PPP. It offered the opportunity to contribute to the content of this important future call. The workshop focused on the 5G requirements of the health domain and the nature of projects and experimental activities that are needed to get Health established as one of the key vertical sectors to be supported by the new 5G infrastructure. The views collected at this workshop will be considered by 5G-PPP Vision Working Group by the end of September and key points will be included in future 5G-PPP vision documents. 5GNORMA and COHERENT 5G PPP projects will jointly organise a workshop on Virtualised Coordinated Spectrum Access for 5G Communications Systems at ISWCS 2016 (September 20-23, 2016, Poznan, Poland). This workshop aims to bring the concepts of dynamic allocation of spectrum to network services and virtualization together and explore if and how novel architectures and technologies based on virtualization can increase the efficiency in spectrum utilization. The 5th 5G PPP information day aims at leveraging on the results of Phase 1 of the 5G PPP (Public Private Partnership) initiative. The goal is to validate research results in proof of concepts and demonstrators having use cases from sectors such as eHealth, automotive, video/TV broadcast, and energy. The topic covers wireless access and radio network architecture and technologies; high-capacity elastic optical networks; and software networks. The projects will be implemented as a programme and be expected to contribute with horizontal results to the programme integration process. Don’t miss the 6th NGMN Industry Conference & Exhibition, taking place on 12th & 13th October 2016 in Frankfurt, Germany! The event features the announcement of leading, international operators’ and vendors’ requirements for the future 5G technology platform. This will be complemented by an in-depth presentation of new 5G enabled business opportunities and use-cases introduced by executives and subject-matter experts.